Each is Steiner Sports and MLB authenticated. The BEST Derek Jeter memorabilia you can buy. LEES SUMMIT, Mo. 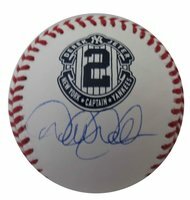 - Nov. 1, 2014 - PRLog -- Looking for a unique and highly collectible Derek Jeter autographed item? Powers Autographs has two awesome items you should definetly consider: his final season logo baseball and 16x20 photo of his final at bat and hit at Yankee Stadium). Each autograph is authenticated by Steiner Sports (Jeter's exlclusive memorabilia provider) and Major League Baseball (MLB). Derek Jeter is one of the most beloved figures in the storied history of the New York Yankees. He won 5 World Series Titles, a Rookie of the Year Award, a All-Star MVP, a World Series MVP, was named to 13 All-Star teams, leads the Yankees in numerous all-time categories, and collected well over 3000 hits. As Jeter approaches his final season, commemorate the Captain's legendary career with this Steiner Sports Exclusive product. This Derek Jeter product is guaranteed authentic and an accompanying tamper-evident Steiner Hologram and COA card. "The Steiner Seal Means It's Real." Steiner Sports is the Official Memorabilia Partner of Derek Jeter and the New York Yankees. Autograph is also Major League Baseball (MLB) authenticated. Comes with a unique MLB hologram # that when verified on their website states the item and date that it was signed. What that means is a MLB representative was present for the signing with Jeter and witnessed him signing your baseball. Yankees' Captain Derek Jeter has personally hand-signed this 'Final Hit' 16x20 Photo-Known to be one of the most prolific baseball figures in history and one of the best clutch performers to wear the pinstripes Derek Jeter, The Captain, is well respected and beloved by many throughout baseball. He is undoubtedly the central figure in the Yankees during their successes in the late 90s and early 2000s because of his hitting, base running, fielding and exceptional leadership; these were the qualities that have helped him become one of the legends in the Bronx. Along with being a five-time World Series champion, he is the Yankees all-time career leader in hits, games played, stolen bases and at bats. It came to no surprised to no one that Jeter would become the Yankees' all-time hits leader, when he surpassed the famed Lou Gehrig in collecting his 2,722nd career hit. This was the moment that brought him into the pantheon of legends in baseball. Celebrate Derek Jeter's illustrious career by owning this unique piece of one the best shortstops to ever play the game. This Derek Jeter autograph is Guaranteed Authentic by Steiner Sports and include a Steiner Sports Certificate of Authenticity and an accompanying tamper-proof Steiner Hologram. "The Steiner Seal Means It's Real." Steiner Sports is the Official Memorabilia Partner of Derek Jeter and the New York Yankees. Autograph is also authenticated by Major League Baseball (MLB). Comes with their uniquely numbered hologram fixed to the photo. When verified on their website, states the item and date it was signed. Most sought after authenticity for baseball autographs. Each is $599 with FREE shipping. You can order at the link below or by calling 650-888-7915. Rich Froning Signed Photos of the 4 x Crossfit Games Champion Now Available! Lorenzo Cain Autographed Kansas City Royals 2014 ALCS Photos and Baseballs In Stock!